To attend or not to attend. That is the question. December is here again, with all of its joys, stresses and holiday networking events. Whether you love or abhor networking and work parties, you are probably finding yourself attending either too many or too few events. I talk to clients every day who are trying to create more time in their schedules and, of course, if you have to cut something, networking events can be a good option. Yet, this decision is not always easy, because networking has the potential to be either one of the best or one of the worst possible uses of your time depending upon a whole host of variables. 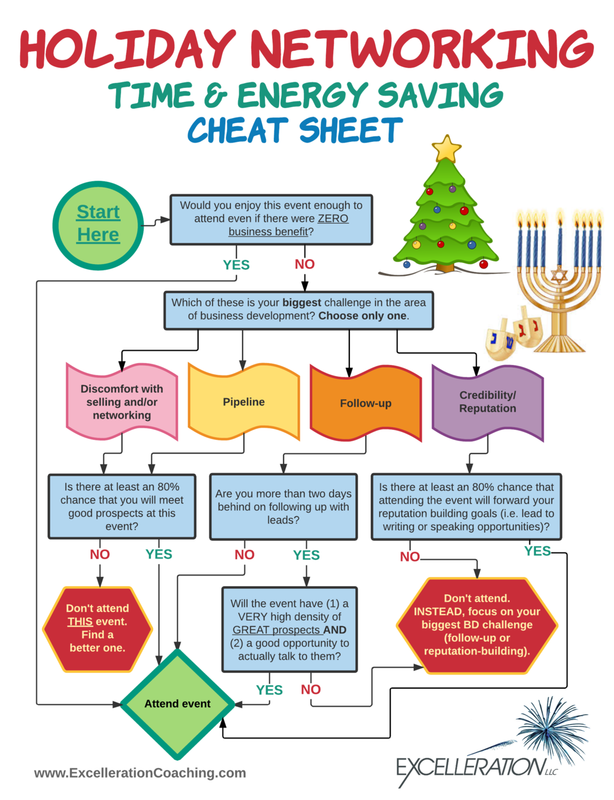 So, my gift to you today is my Holiday Networking Time & Energy Saving Cheat Sheet. While a flow chart was probably not on your holiday gift list, I’m really excited about this and hope you will find it useful. I’ve been using it myself, just because it simplifies the decision-making process. Whether a lawyer attends a networking event or not, typically, has more to do with timing, the pushiness of colleagues, pending billable work, and other random factors, rather than the potential value of the event itself. If you are exhausted and on the verge of collapse, skipping an event to get some sleep is probably a wise choice. But otherwise, it is helpful to think through your decision rather than just blindly following your typical pattern. Please note that although this cheat sheet is focused on networking for the purpose of business development, the same basic structure works for networking in a job search. If the parallels are unclear, feel free to email me. Here is the cheat sheet with an explanation below. Start at the “Start here” button in the upper left of the page. First, ask yourself, “Would you enjoy this event enough to attend even if there were ZERO business benefit? If you have been active in an organization for years, love the people, and would truly enjoy it, by all means, attend the event. Not everything has to have a business benefit. Go have fun! However, you should probably be honest with yourself that this is a social event rather than as a business development activity. If you’ve known people for years, and are trying to get business from them, having lunch to discuss business possibilities would be a valuable use of your time and likely yield results; whereas another social event probably will not. Next, consider which of these is your biggest challenge in the area of business development. Choose only one. Although most people have challenges in multiple areas, for this exercise it’s important to choose the one that appears to be your biggest challenge. If you are uncomfortable with selling and/or networking, a networking event is going to be useful for you simply so that you can practice and develop skill in an area that is a challenge. Similarly, if your biggest weakness in the area of business development is having a narrow pipeline, attending networking events is probably a good option. Your “pipeline” is the people who you are developing relationships with for the purpose of getting business. If you’re actively getting to know multiple people in the same company, you can count them all separately. A simple way to check the strength of your pipeline is this: If you can call every one of your prospects and leave voicemail messages, and be finished within an hour, then you could use a bigger pipeline. If either discomfort with networking or a small pipeline is your biggest challenge, then networking is probably a very good use of your time. However, that doesn’t mean the event appearing on your calendar for tomorrow night is actually your best option. So, first, consider if you think there is at least an 80% chance that you will meet good prospects at this event. If yes, attend the event. If no, find a better one and attend that. The third significant challenge area for most people is follow-up. I would venture to say that virtually everyone feels like they are bad at follow-up. It’s like meditation and that regard. (Even people who meditate daily often feel like they are bad at it.) Follow-up takes discipline, focus and organization. Whether you like doing it, or feel like you doing well are completely irrelevant to this inquiry. The only question you should be asking yourself is, “Are you more than two days behind in following up with leads?” If you have people who you met last week who you plan to follow up with but you haven’t done it yet, the answer would be “yes.” If you have reminders in your calendar from last week to reach out to specific leads and you haven’t done it yet, the answer would be “yes.” If you chronically drop the ball on follow-up, spending time meeting more prospects, who you will also not follow up with, is a waste of time. So, there is a two-part inquiry here. If you are up-to-date on your follow-up, go ahead to the event. If you are not, I simply recommend raising the bar on how good the event needs to be in order to justify your time. If the event is going to have a very high density of great prospects, not just decent ones but truly great ones, and if it is the type of event where you will actually get to mingle and meet people, by all means, go. It sounds like a fantastic opportunity. The final challenge area is credibility and reputation. If you are doing everything else right, if you are comfortable networking, if you have a solid pipeline, if you follow up consistently, and you’re still not getting business or not as much as you think you should, a great place to look is how to improve your credibility and your reputation. There are many ways to do this: speaking, writing, membership in elite organizations, leadership positions, etc. If this is your challenge, networking can still be an extremely valuable activity. But again, you just want to make sure it’s targeted in the right way. So, the question to ask is, “Is there at least an 80% chance that attending the event will forward your reputation building goals?” Will you be able to talk to conference organizers, editors of publications, or leaders of relevant organizations? If yes, attend and pursue those opportunities. If no, instead of attending the event, use the time to research, brainstorm article ideas, or go through your existing contacts to identify those who might be able to help you with credibility-building opportunities. Regardless of how you decide to spend your precious hours this holiday season, I wish you serenity, joy and meaningful time with loved ones.